An Arctic storm is set to sweep up the East Coast this week, bringing record-breaking cold and snowfalls as far south as Florida and as northern as Maine. The 'bomb cyclone' is expected to be the region's most intense winter hurricane in decades, sparking a flurry of wind chill advisories and freeze warnings across the states. 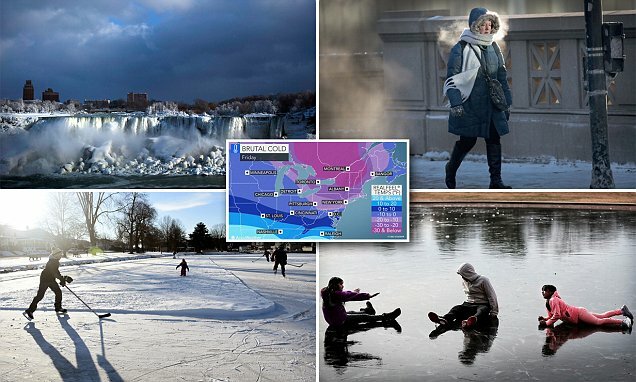 The freezing temperatures have already claimed nine lives in the past week and East Coast residents are now bracing for the next hit of 'bitterly cold temperatures'. 'Reinforcing shots of arctic air will continue across much of the Eastern half of the country through this week keeping afternoon highs as much as 10 to 20 degrees below normal,' the National Weather Service said. The storm is known as a weather bomb, explained by the Weather Channel, as a bombogenesis which involves a rapid drop in atmospheric pressure of 24 millibars or more in a period of 24 hours. It is expected to bring blizzard-like conditions to Boston, Long Island and Maine, freezing sleet and snow to Charleston and South Carolina, and has already seen parts of the Niagara Falls frozen over. New York City will get hit with up to 4 inches of snow as wind chill temperatures plunge to minus 20 on Friday. The service said a deadly mix of snow and freezing rain is expected to hit the Atlantic seaboard today, from Florida to North Carolina, bringing with it low visibility, icy roads and treacherous driving conditions across the region. While Georgia Gov. Nathan Deal declared a state of emergency through Friday for 28 counties because of the frigid weather.